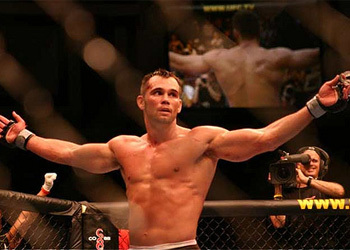 Rich Franklin has reached out to middleweight king Anderson Silva, the man that slapped him silly twice, to prepare for his UFC 99 scrap against Wanderlei Silva. With the two Silvas at odds, the line in the sand has been drawn, and Rich has already picked his side. Anderson recently called Wanderlei’s decision to enter his 185-pound division “pretentious,” and welcomed a future fight against his former training partner. Wandy fired back by stating Franklin can train with whoever he wants, come June 13th the former UFC middleweight champ will be eating leather regardless. After that, he will be hunting for the champ. With his career at a crossroads, Franklin was simply searching for ways to improve his MMA game. He didn’t intend to get caught in the middle of an ugly feud, but he knows where his loyalties lie. And what is a typical training day with the world’s deadliest striker like? It takes a lot to ask the man that jacked your title from you to help you get better, but that is exactly what the proud Franklin did. He loves to fight and will do anything to prolong his obsession. Let’s see if he is still enjoying it when he meets the former PrideFC champ at the Lanxess Arena in Cologne, Germany.